Snow avalanches occur for very specific reasons and are part of the winter environment in every steep, snowy mountain range--including the Sierra Nevada. 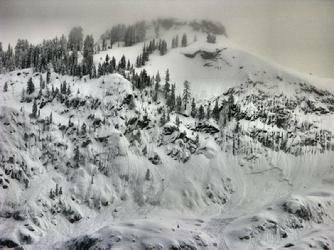 As backcountry riders we must have the skills to manage our risk in avalanche terrain. 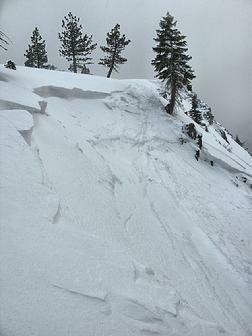 Most avalanches that injure or kill are triggered by those riding the slope. Have your avalanche hazard assessment skills kept pace with your ability to access avalanche terrain? 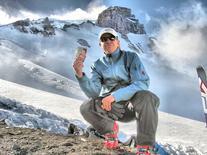 With proper education and training nearly all avalanche accidents can be avoided. Donner Summit Avalanche Seminars are designed for backcountry skiers, snowboarders, split boarders, and all who work, play, and seek adventure in the high mountains. Donner Summit Avalanche Seminars are professional and comprehensive courses based on curriculum developed by the American Institute for Avalanche Research and Education (AIARE). The courses have a low student-to-instructor ratio, and exceed the official recommendations established by the American Avalanche Association. DSAS offers AIARE certificated Level 1, Level 2, Avalanche Safety Refresher Courses, and custom Avalanche Rescue Courses. Course fees include handouts, AIARE Student Manuals, AIARE "Rite-in-the-Rain" field book, use of avalanche rescue gear and snow science tools, plus many extras. Classroom sessions are held in Truckee and/or Donner Summit; field work is held on Donner Summit. Courses fill quickly--please register early. Considering attending one of our courses? Here's a list of recommended equipment. Also, some FAQs about our courses. Donner Summit Avalanche Seminars is an AIARE course provider and operates under a special guiding permit of the Tahoe National Forest. Donner Summit Avalanche Seminars director Randall Osterhuber is a career snow scientist in the Sierra Nevada, avalanche forecaster, and prolific backcountry skier. He is a long-time director and technical advisor to the Sierra Avalanche Center and has guided and taught thousands of skiers and riders. Randall and all DSAS instructors have decades of experience in many of the world's high mountain ranges and bring strong and diverse disciplines to avalanche hazard assessment and to the teaching of avalanche safety. 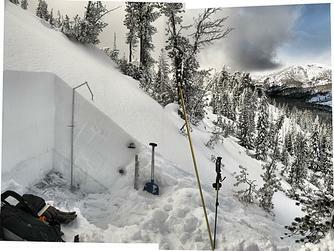 Donner Summit Avalanche Seminars is committed to a safe, supportive, and fun teaching environment. DSAS is proud of their 100% safety record. "...while on a ski tour, I tried to steer the discussion away from intangibles, and keep to readily observable facts, and our group made the right call. As it turned out, another party triggered an avalanche. For the 14th time--thanks!" "...thank you very much again for an excellent class! It was fun and very educational." "Thank you for such great guidance and expertise yesterday. It was very fulfilling in so many ways--challenging, fun, educational." "...thank you for an excellent course last weekend! It was really a great experience. Thanks for doing what you do really, really well." "Thanks again for the fantastic training program. Follow-up from the attendees was 100% positive--including three people who had previously taken a Level 1 class all saying your presentation was the best they've had." How often is there skiable snow on Thanksgiving? All our regularly scheduled public courses are completed for the season. But deep, cold snowpacks still exist over most of the Sierra Nevada. If your group would like a private avalanche safety course (Level 1, Level 2, refresher, rescue) please contact us. Thank you. Your group, your schedule: We run custom Level 1 and Level 2 courses for your group of 6 or more, as well as 1-day avalanche safety refresher courses and avalanche rescue courses. Please call or email for more information.